A massive explosion tore through a chemical plant in Crosby, Texas, Tuesday, killing at least one person, injuring two others and promoting a shelter-in-place order for the surrounding community as firefighters worked to extinguish an apparently out-of-control fire there, officials said. The explosion occurred at the sprawling KMCO plant just after 11 a.m., sending a large plume of smoke over the area, about 9 miles east of Houston. One person was killed in the blast, according to the Harris County Sheriff’s Office. 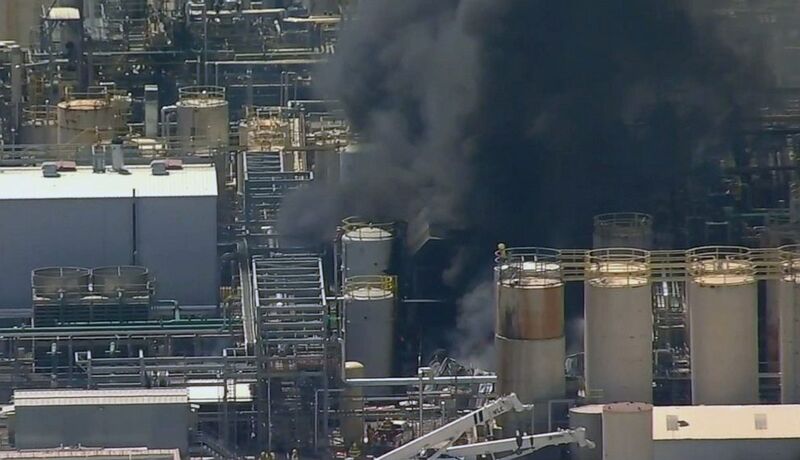 Two people believed to be workers at the chemical plant were taken by emergency helicopter to local hospitals. Their conditions were not immediately released. 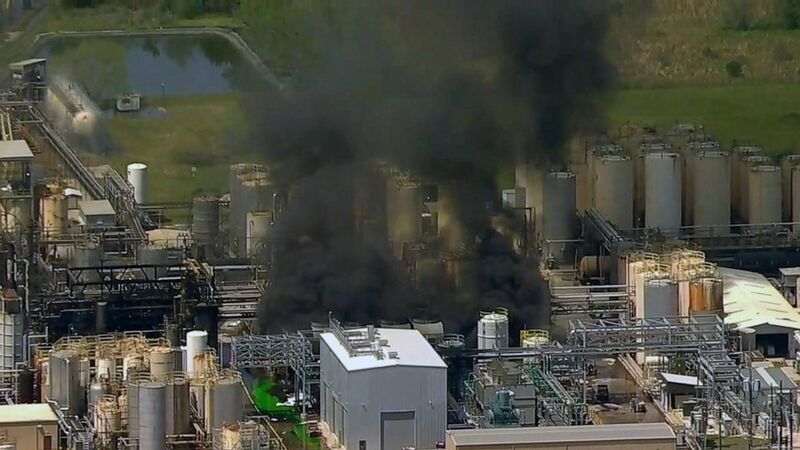 (KTRK) A chemical plant explosion in Crosby, Texas on April 2, 2019. The Harris County Fire Marshals Office said one person was unaccounted for. It was not clear if that was the person who died. The blast shook homes in the neighboring area and a woman a mile from the plant was knocked to the ground, according to ABC station KRTK. People 20 miles away reported feeling the explosion, the station reported. The Harris County Sheriff’s Office issued a order for schools and homes within a mile to shelter in place. The sheriff’s office said the preliminary investigation indicates the a colorless, flammable gas called isobutylene initially started fire. There was no immediate word on what other chemicals were burning, but the plant primarily manufactures antifreeze products, according to KTRK. Villalobos said he and about 20 other workers immediately ran to an exit gate only to find it locked.